Incredibly violent new trailer out now. 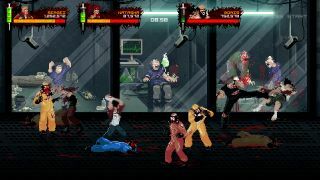 Fans of Streets of Rage and Hotline Miami-style queasy ultra-violence will be well served by Mother Russia Bleeds, Le Cartel's sidescrolling beat-'em-up set in an alternate U.S.S.R. We finally have a release date for that—September 5—so only a few weeks left to go. To mark the occasion, publisher Devolver has released a hugely violent new trailer, which you can watch below. Mother Russia Bleeds features four-player co-op, but if you were hoping to play it online, know that multiplayer will be local only, at least launch. The developer announced the news on Twitter, stating that "there is no online co-op planned at launch but we want to implement it down the road if possible along with new game modes. Thx!" You can find Mother Russia Bleeds on all your favourite online game shops, and there's a 10% discount if you choose to buy it before reading any reviews or impressions.